UKZN MSc graduate Ms Ndoni Mcunu was named in the Mail & Guardian’s 2016 list of 200 Young South Africans showcasing the talent, drive and innovation of young folk striving to improve the lives of others. Mcunu was recognised in the field of education for her work in founding the registered Black Women in Science (BWIS) non-profit organisation, set up to promote careers in Science, Technology, Engineering and Mathematics (STEM) for young, rural, Black women who have limited access to knowledge and guidance in this regard. She hopes increased exposure, support and mentorship will see more Black women enter science in Africa. BWIS holds scientific presentations and workshops in rural high schools, identifying potential bursary candidates to support and guide through tertiary education. BWIS was inspired by Mcunu’s personal experience of pursuing science. Science was not always an interest of hers, however she saw family members becoming successful scientists, exposing her to the field. ‘What provoked my interest in science was actually my struggle in understanding maths,’ revealed Mcunu. 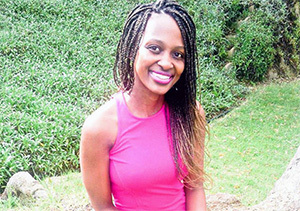 Mcunu credited her master’s supervisor, Professor Onisimo Mutanga, with challenging her thought patterns and encouraging her to pursue a PhD, and said that lecturers such as Professor Trevor Hill, Dr John Odindi, Ms Dayle Trotter and Mutanga inspired innovative, critical thinking, affecting how Mcunu thinks and views people. ‘In my academic career, lecturers, friends and colleagues showed me that becoming a scientist is not necessarily about how smart you are but how willing you are to learn and work hard,’ said Mcunu. While at UKZN, Mcunu was involved in ENACTUS and the University newspaper, encouraging her to be a person of change and influence for whom helping others and sharing knowledge was never a burden. She was also selected as a Miss Earth South Africa Environmental Ambassador in 2014. Mcunu is pursuing her PhD at Witwatersrand University’s Global Change and Sustainability Research Institute, supervised by Professor Bob Scholes. She hopes to contribute to improving agricultural production and food availability for small-holder farmers by predicting possible impacts of climate change on food production. After completing her PhD, Mcunu wants to be involved in policy decision-making and strategic planning for agriculture and food security in Africa, which contributes to building a strong economy. She would also like to work closely with international organisations and local government, and hopes BWIS will operate throughout Africa and that her PhD will inspire young Black women to pursue science. Mcunu acknowledged close friend and colleague, Serge Kiala, for his support, as well as other colleagues in the Environmental Science Department for their contributions to her career. She thanked God, her parents and siblings for their support, even when she wanted to give up.